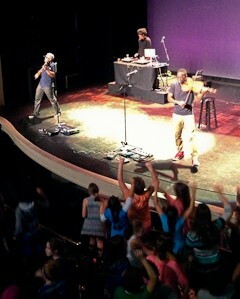 As the last of its five community events commemorating its 50th anniversary, Cain Hibbard sponsored a lively and inspiring performance by the musical duo Black Violin at the Mahaiwe Performing Arts Center in Great Barrington, Massachusetts. The two violinists played their own original blend of classical, Hip-Hop, R&B, and bluegrass music to a packed theatre of middle school students from area schools. The students were on their feet for most of the performance, captivated by the skill and energy of the performers. The performance was part of the Mahaiwe “ah-ha” educational series, a series that Cain Hibbard has been privileged to sponsor every year since the program’s inception.